My work is often about the dark side. In this piece i have sought ways to portray the suppressed subconscious, those parts of our mind that become split off from our conscious awareness. 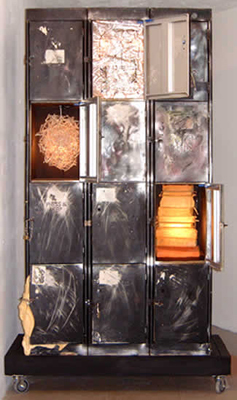 I have used the separate compartments of a set of lockers to represent this notion of containment and disconnection, whilst still part of the whole piece. I have made objects that are suggestive of mechanisms of the brain with being to literal, such as our genetic quality, half forgotten memories, instincts, desires and fears. It is interactive so that participants can open and shut doors. Lights come on to illuminate the dark recesses but also to create shadows.